Book Reviews – “Death by DNA” eBook was published in 2016 and was written by Pierce Roberts. This is Mr. Robert’s first publication. I received an ARC of this novel through https://www.netgalley.com in return for a fair and honest review. I categorize this novel as ‘PG’ because it contains scenes of Violence, Mature Situations and Mature Language. The story is set primarily in contemporary Europe and South America. The primary character is Tom O’Dell, a rural Wisconsin dairy veterinarian. Something is causing animal specie deaths across the world in small localized areas. O’Dell is one of many vets across the country that are drafted by the USDA to investigate. They are sent to Atlanta for training and there he meets the lovely Dr. Kate Vensky of the USDA. Not long after the training, over 200 cows and heifer calves are found dead on the Fort Peck Indian Reservation. While there investigating, O’Dell and his colleagues meet a Lakota Sioux shaman who has seen vision of a ‘Destroyer’ coming. As their investigation continues, they suspect that the cause of the animal deaths is the result of an invention originating in Nazi Germany. It becomes a race as to whether they will find who is behind the plot before the killing becomes widespread and targeted at humans. As they proceed, they find that their investigation and very lives are under threat from Nazi sympathizers. I thought that the 11+ hours I spent reading this 433 page thriller were interesting. The story combined romance, religion and the paranormal as well as some science fiction. While I liked the overall plot, I think it could have been given more intensity. Likewise, I think the characters could have had more depth to them. I think better cover art could have been chosen. I give this novel a 3.5 (rounded up to a 4) out of 5. Further book reviews I have written can be accessed at https://johnpurvis.wordpress.com/blog/. Book Reviews – “Found in Time” eBook was published in 2017 and was written by J. K. Kelly (http://jkkelly.com). This is Mr. Kelly’s first novel. I received an ARC of this novel through https://www.netgalley.com in return for a fair and honest review. I categorize this novel as ‘R’ because it contains scenes of Violence and Mature Language. The story is based on today, but the team travels to various places and times on their missions. The primary character is US Marine Major JJ Jackson. Jackson has been a covert operator for some time, but is now asked to lead a new, even more secret unit. The unit’s mission is to test out a time travel device, then to eventually use it to fight the terrorists they have been confronted with. Their missions back in time are filled with danger and they meet several historical figures. Their most severe challenge comes from an unexpected quarter. I really enjoyed the 8 hours I spent reading this science fiction thriller. It does have a bit of a religious twist. I liked the characters developed in the novel, and the plot. I did have a feeling in the first half or so that it was a collection of short stories stitched together. I do hope that there are more books to follow with the same characters. The cover art is OK, but I don’t think that it relates well to the story. I give this novel a 4.5 (rounded up to a 5) out of 5. Book Reviews – “7” eBook was published in 2017 and was written by Van R. Mayhall Jr. (https://vrmayhalljr.wordpress.com). This is Mr. Mayhall’s third publication and the third book in his “Cloe Lejeune” series. I received an ARC of this novel through https://www.netgalley.com in return for a fair and honest review. I categorize this novel as ‘PG’ because it contains scenes of Violence. The story is set mostly in the Middle East and around the Mediterranean. The primary character is Dr. Clotile “Cloe” Lejeune. Lejeune is associated with LSU and is in the New Orleans area working on piecing together and interpreting writing on ancient scrolls obtained in the second volume of the series. The world seems to be coming apart at the seems with more violence and disorder every day. Lejeune, along with her son US Army Captain J.E. Lejeune and Monsignor Albert Roques, are called to Rome by the Pope. As the world turns to chaos around her, she, and her team, must fight the manifestation of evil that is trying to destroy the Catholic Church and humanity. The fear is that evil is re-emerging after 1000 years and the End of Times as described in the Book of Revelations is upon us. A group of people from all over the world, of different ages and backgrounds are drawn to New Orleans to join with Lejeune in the fight. These 7 have been touched by an angel and are the “good” God has sent to combat the rise of evil. This was an interesting read of 6 hours for the 329 page Religious Thriller. I liked the characters and the plot, but they seemed weak and watered down to me. I’m not sure what the cover art has to do with the story. To me it was a poor choice. I give this novel a 3.5 (rounded up to a 4) out of 5. Is there a scientific path to god? Two film students set out to document their attempt to use science to communicate with god. Have their experiments made them crazy or have they truly found the answer? A well produced and very different film. The first thing we did on the second day of our trip while in Barcelona was to visit the Basilica de la Sagrada Familia. The Basilica was designed by Spaniard Antoni Gaudi and has been under construction since 1882. Completion of the immense structure is not expected until 2026. My wife first visited in 2009 and could see many changes since then. The exterior of the church is covered in intricate carvings that tell many different stories. The church was consecrated by Pope Benedict XVI on November 7, 2010. The interior follow the themes set outside. The columns are shaped like trees with ‘branches’ at the top to support the ceiling. We toured through the Basilica, then ascended one of the towers. There was a good view of the city. The trip up was easy in an elevator, but down was via about 400 steps. Afterwards we went through the museum under the Basilica, which was well worth the time. Whether or not you are Catholic, you will find the Basilica de la Sagrada Familia worth your visit. There is a fee (15-29 Euros) to tour the Basilica. Book Review – “Astrum Divinus” eBook was published in 2013 and was written by John D. Christopher. This is Mr. Christopher’s only publication. I received a galley of this novel for review through https://www.netgalley.com. I categorize this novel as ‘PG’ because it contains scenes of Violence. The story is set in Englad, France and Germany. The primary character is historian Dr. Peter Northcott. Northcott has been having disturbing dreams since child hood. Now in his early 30s he is sudddenly drawn into a destiny he was unprepared for. His family has been part of an order fighting evil for centuries. Now he must step up and be the weapon to confront a new campaign by the devil to take over the world. I enjoyed the 9.5 hours I spent with this 277 page Religious Thriller. It was a little reminiscent of the Dan Brown novels, though not as involved. There was a lot about Northcott, but little about his adversaries, and frankly his battles with the forces of evil were a little disappointing. The cover is reasonable given the story, but not one that makes me want to read the book. I give this novel a 3.4 (rounded down to a 3) out of 5. “The Revelation Code” eBook was published in 2016 and was written by Andy McDermott (http://www.andy-mcdermott.com). Mr. McDermott has published 15 novels with this being the eleventh in his “Nina Wilder and Eddie Chase” series. I received a galley of this novel for review through https://www.netgalley.com. I categorize this novel as ‘R’ because it contains scenes of Violence and Mature Language. The novel is set in a variety of locations in the US, the Caribbean, and the Middle East. The primary characters are archeologist Dr. Nina Wilde and her British ex-SAS body guard and husband, Eddie Chase. During Operation Iraqi Freedom, a CIA officer, Ezekiel Cross, stumbles across an amazing discovery. He is convinced that the small statue he finds is one of the four angles of the Apocalypse, and that he is now a messenger anointed by God. Over the next several years he forms a religious cult with the goal of finding the remaining three angels. He then plans to use them to bring the End of Days as foretold in the book of Revelations. Wilde and Chase are kidnapped by Cross, and he uses Chase as leverage to force Wilde to find the remaining angels. Wilde and Chase must find a way to escape Cross and find the remaining angels before Cross can. They know that if Cross is able to retrieve the remaining angels, he will use them and hundreds, maybe thousands will die. I thought that the 11.5 hours I spent reading this 482 page Thriller were, for the most part, enjoyable. I liked the plot and event though there were several other books before this one in the series, it read well as a stand-alone novel. The one thing, for me, that was a detraction was the constant sarcastic remarks that many characters made to one another. That got very old, very fast. That said, I would probably read another novel in this series. I give this novel a 3.8 (rounded up to a 4) out of 5. 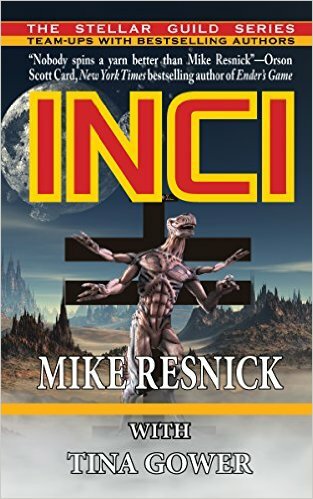 “INCI” eBook was published in 2015 and was written by Mike Resnick (http://mikeresnick.com) and Tina Gower (http://www.tinagower.com). Mr. Resnick is an experienced author with over 70 publications, while Ms. Gower is just beginning with just three. I obtained a galley of this novel for review through https://www.netgalley.com. I would categorize this novel as ‘PG’ as there are instances of Mature Language. This Science Fiction novel (really a collection of three novellas) is set in a far future where Earth is colonizing other worlds. In the first novella by Gower, the Reverend Barker is sent along with scientists to the distant world of Kaus to bring Christianity to the local primitive inhabitants. He stumbles upon what he sees as a very distinct parallel to the story of Jesus being crucified in the native’s history and, as on Earth, it spawns a following. Fast forward about 500 or so years to the second novella, also by Gower. A film editor, Thomas Inkle, and his sick and dying wife, Anita Inkle, stumble upon mention of the Barker Testament. They investigate further and discover that the Testament tells of a story similar to that of Jesus on Earth. Soon their world turns upside down as electronic systems at their home fail and data mysteriously disappears. In the third novella by Resnick, Tom Inkle takes what he and Anita have learned to a noted investigative journalist, Gar Mathews. Mathews digs into the story, traveling to Kaus and other worlds following a trail of crucifixion stories. Whys has the Barker Testament been suppressed? The three novella concept worked well with this story arc. This is a book coming out of the Stellar Guild (http://www.stellarguild.com) that teams up established authors with a protege. I am not a fan of short stories, but this combination turned out well. While I think that Resnick’s piece was the best, the three worked well together and I enjoyed the 3.5 hours I spent with the book. I give this novel a 4 out of 5. 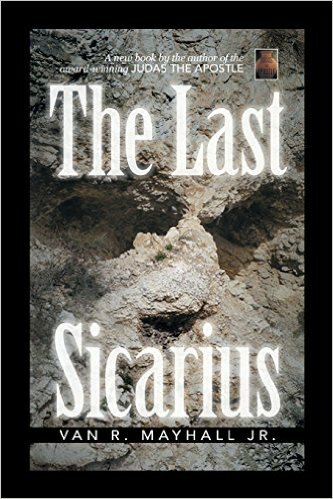 “The Last Sicarius” eBook was published in 2014 and was written by Van R. Mayhall Jr. This is Mr. Mayhall’s second novel. I obtained a galley of this novel for review through https://www.netgalley.com. I would categorize this novel as ‘R’ as there are instances of Violence. This Religious Thriller novel is set in contemporary Louisiana, France, Jerusalem, and Tunisia. Clotile Lejeune returns as the primary character. She has gone to work at LSU translating the scroll uncovered in the first book of the series, “Judas the Apostle”. She is asked to travel to Rome and there meets with the Pope. He asks her to temporarily leave her work and help find the cache of scrolls that her father had told her about. Many have tried to find the cave in the Tunisian mountains, but the Pope feels Lejeune will have success where so many others have failed. They are also in a race to get to the cave with the scrolls as the organization they all thought had died with the ‘Collector’ has reemerged and is seeking the cave. With the support of the Catholic church and her son, Lejeune and her team strike out to search for the cave. They face numerous attacks from their mysterious foe, and loose friends. There are many life and death struggles through the novel as the plot winds its way towards a conclusion. I spent a little less than 7 hours with this novel and enjoyed it. I felt that his novel was a little more polished that the first. I give this novel a 3.8 (rounded up to a 4) out of 5. My book reviews are also published on Goodreads (https://www.goodreads.com). 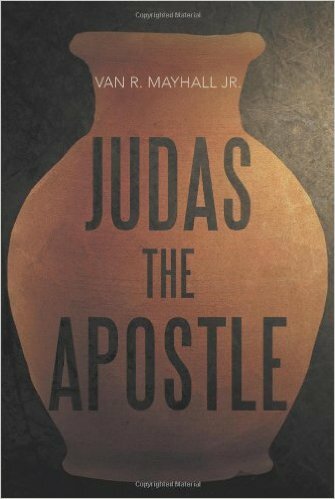 “Judas the Apostle” eBook was published in 2013 and was written by Van Mayhall Jr. This is Mr. Mayhall’s first novel. I obtained a galley of this novel for review through https://www.netgalley.com. I would categorize this novel as ‘R’ as there are instances of Violence. This Religious Thriller novel is set in contemporary Louisiana, France and Israel. Clotile Lejeune holds a Phd. in Ancient Languages and is a college professor in Seattle. Her estranged father is murdered and she returns home to New Orleans with her son for the funeral. An old oil jar that her father came into possession of during a mission in World War II to north Africa is bequeathed to Lejeune. There seems to be a connection between the old jar and her father’s murder. She soon finds herself intertwined with priests from the vatican as well as operatives of a mysterious figure who is wiling to let nothing stand in the way of his possession of the jar. Lejeune begins to decipher the contents of the jar, but she finds her life in jeopardy. When one of her party is kidnapped, she and her small entourage travel to France to exchange the jar for the prisoner. The story has lots of twists and turns, and as the title implies, the contents of the jar reveals new information about Judas Iscariot. The story feels a tiny bit like ’The Da Vinci Code’ in that Lejeune and company are on the trail of historical documents secreted in an old French church. I liked the plot and enjoyed the 7 hours I spent with the novel. That said, I feel that the novel wasn’t as polished as it could have been. I give this novel a 3.6 (rounded up to a 4) out of 5.